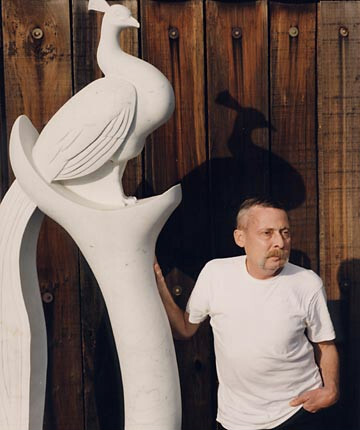 Carlyle Montgomery’s (1947- 1998) interest in the arts began as a child when he experimented in both two and three dimensional work. His love of art was equaled only by his love of nature. His passion for the environment was further fueled when his parents moved to Ojai in 1964. Carlyle attended Nordhoff High School and graduated in 1965. He went on to study aviation at the Northrop Institute of Technology and earned a license to work in aircraft air frame and power plant maintenance. Montgomery’s affection for art remained a hobby throughout his 23 years in aviation. In 1979, Montgomery met a well respected stone sculptor by the name of John Cody on a wilderness expedition. That meeting changed Montgomery’s life forever. The two men quickly became friends and Montgomery began to spend all of his spare time as an apprentice to Cody. For five years Montgomery avidly studied every aspect of stone carving. In 1990 he traveled to Italy with Cody to study classical techniques under the direction of renown sculptor Cesare Riva. All of these experiences allowed Montgomery to learn the necessary skills to build the confidence he needed to branch off on his own. Upon his return from Italy, Montgomery sold his successful air craft maintenance business and devoted his life to his muse full time. Montgomery’s scholarly approach and honed skills surpassed the most educated and experienced sculptor. The realism in his work brings his subjects almost literally to life. This is clearly a skill which can only be perfected when the artist has a true understanding of his subject’s physical make up and their behavior. Montgomery often incorporated a human element into his art. A major work, Soaring in Stone, is on permanent display in the courtyard at the Ojai Valley Museum. The piece depicts a life size California condor and a young man dressed in contemporary clothing reaching for his own freedom. Both subjects illustrate the primal urge to be free and the need to be understood. The artist strongly believed that “hope for the future of wildlife remains with the next generation.” To that end, Montgomery has taught both children and adults, privately and publicly. Carlyle Montgomery’s documentation took place in 1996. The FOTM Archive contains extensive information about this artist.